Lot #8: 1.8a, very high, open to heavily wooded, long north views. Perfect for cape or cottage. $105,000. Lot #10: 3.1a, meadow and gorgeous old growth hemlock/pine forest; long views up the valley to the north. $130,000. Lot #11: 2.3a, meadow and deep, ravined hemlock/pine forest; long views up the valley to Snake and Buck Mountains. $130,000. Lot #14: 2.6a, heavily wooded, opening onto meadow with long valley views. Adjacent to protected natural area. $85,000. Lot #15: 1.8a, open meadow, flat and easily buildable. Long views up the valley to Snake and Buck Mountains. Adjacent to protected natural area. $85,000. 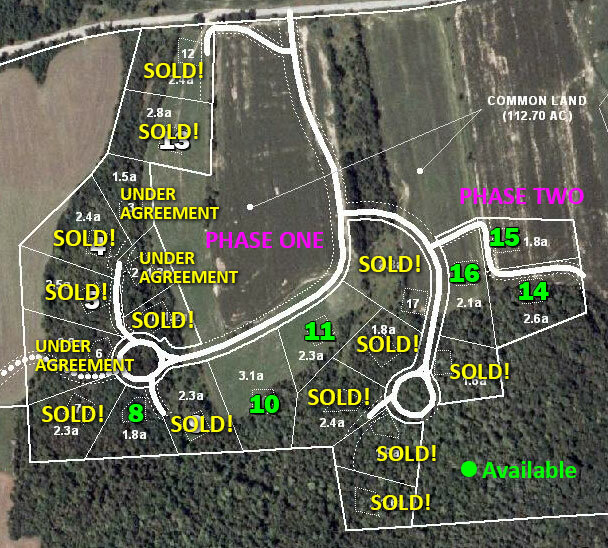 SPECIAL: Buy Lots 14 & 15 together (one open, one wooded) for $135,000! 4.4 acres total plus many acres of permanent open space to the east. Save $35,000 on the package. Lot #16: 2.06a, Mostly open meadow, lightly wooded to the south, long views up the valley. $85,000.